Red Flush Casino is a high-quality online gambling site perfect for real money players new to playing slots and table games on the World Wide Web. 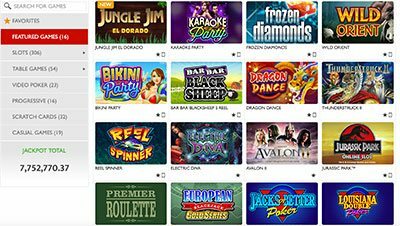 Part of the renowned Fortune Lounge, a group of premium casino sites well known for hosting the very best games software by Microgaming, Red Flush offers 400+ slots, table games, live dealer and other niche titles to its members. Note: As of 2017, Red Flush no longer accepts players from Australia. This review is intended for an international audience only. Red Flush is a great online casino which offers its players options in how they wish to access their offerings. All of their games can be played in instant-play format, meaning you simply load them up and play in your Web browser without the need to download any software, or you can opt for Red Fortune’s specialised casino suite software for a dedicated program to open when playing on your desktop computer. Mobile gamers can also access the site via smartphones or tablets (Android, iPhone, iPad, Samsung) and enjoy slots and table games-on-the-go without the need to download an app, though there are less games available due to the porting process. Slots: 300+ of Microgaming’s very best video slots are on offer here, including progressive jackpot games like Major Millions, Mega Moolah, Mega Moolah Isis and Treasure Nile, along with staple favourites such as Avalon II, Bikini Party, Game of Thrones, Hitman, Immortal Romance, Terminator 2, Thunderstruck II, and Tomb Raider. Casual games: 20 niche titles bolster Red Flush’s impressive catalogue, including Ballistic Bingo, Bingo Bonanza, Crown and Anchor, Hexaline, Mayan Bingo, Monkey Keno, Pick ‘N Switch, Premier Racing, Premier Trotting, Samba Bingo, Spingo, Super Bonus Bingo and Three Wheeler. Scratch cards: 30+ Microgaming developed online scratch cards (also known as instants or scratchies) are playable at Red Flush Casino, including Beer Fest, Bunny Boiler, Dawn of the Bread, Flip Card, Foamy Fortunes, Golden Ghouls, Offside and Seek, Slam Funk and Whack A Jackpot. Table games: 50+ list of every classic casino game – baccarat, blackjack, craps, roulette, poker – is available to play, made up of Microgaming’s best rule variations. Try Baccarat or High Limit Baccarat, European Blackjack Gold, Multi-Hand Blackjack, French Roulette, Multi-Wheel Roulette Gold, and even less common games available on the World Wide Web like High Speed Poker, Pai Gow Poker and Red Dog. Video poker: Expect to find the entire Microgaming collection of video poker games at Red Flush, including Aces and Eights, Aces and Faces, All Aces, All American, Bonus Poker, Deuces Wild, Double Joker, Joker Poker, Louisiana Double, Tens or Better and the multi-hand versions. Head on over to RedFlushCasino.com to check out their 400+ real money casino games catalogue. Red Flush Casino is part of the Fortune Lounge Group and receives the same massive comps and promos as other premium casinos. Huge promotions like luxury boat cruises occur annually while others with massive cash prizes occur every couple of months. There’s also one-off bonuses granted weekly, so keep an eye out once you’re a member to get your money’s worth. To receive regular updates, opt to get promotional emails sent to your inbox, as Red Flush only advertises many of its unique bonuses to registered members rather than publicly on-site. The Red Flush also have a rewards program for members. Every real money wager you place at the site rewards you with points to redeem them for more casino credits. Every game grants different allocations of points, with slots worth one point per credit wagered, table games one point every five credits wagered, and so on. Make sure to check out their loyalty page for further details on the current amount of rewards points necessary to redeem them for cash. Red Flush Casino is great when it comes to banking options. It supports a huge list of popular and trusted deposit options, such as MasterCard, Visa, Neteller, Skrill, and PaySafeCard – and more as listed at the top of review. is it has far less options for deposits and withdrawals than other online casinos. Simply click the ‘Bank’ button in the casino lobby when logged in and click ‘deposit’ in the banking section to choose your method and the amount desired. Withdrawal options are a lot more limited, with only a handful of services supported. Thankfully, these include the most popular and most used methods, like Bank Transfer, Cheque, credit and debit cards (MasterCard, Maestro and Visa) and e-Wallets (Entropay, Neteller and Skrill). Withdrawing your money at Red Flush is made very easy, and we had no issues with processing (same steps as depositing). First, click on the Bank button in the casino lobby and then click on the withdraw tab in the banking section. Enter the amount you wish to withdraw and select your preferred casino withdrawal method. Processing times at Red Flush for withdrawals were a little slow, but it all depends on your chosen withdrawal method. Expect your request to be processed by Red Flush within 24 hours on Monday to Friday, and for the money to appear in your personal account within 72 hours. Make sure you provide proper documentation when requested to get your winnings, such as a driver’s license. Regulated and licensed by the Malta Gaming Authority, Red Flush adheres to iGaming industry standards and provides a safe and responsible online gambling environment. It has been independently tested and audited by eCOGRA (e-Commerce Online Gaming Regulation and Assurance), a non-profit regulator agency that ensures Internet casinos are fair and payout accordingly. They also have implemented 128 Bit digital SSL security encryption technology to protect player information and financial transactions, specifically software from Risk Sentinel who specialise in fraud-management. We have to hand it to them – Red Flush knows customer service. The online casino has every option imaginable for players to contact their support team, and we always appreciate it when a real money gambling site goes the extra mile.